Munchkin Munchies: Arty McGoo and Cookies Too! Arty McGoo and Cookies Too! Does this look familiar? It's my header (and all the elements) in cookie version, given to me by Arty McGoo~ Liz! Aren't they AMAZING?!? I first heard of Arty McGoo when SugarBelle (Callye) linked to some of her cookies on facebook. What a great discovery! On her blog, I noticed that Arty McGoo lived only about an hour north of me:) A few weeks later we decided it would be fun to meet, so on Friday we met at Joann's for a bit of shopping and then had lunch at Applebee's. We had such a pleasant lunch together. Liz is a darling girl, and I thoroughly enjoyed getting to know her. We even shared a maple butter blondie for dessert and it was oh, so good! 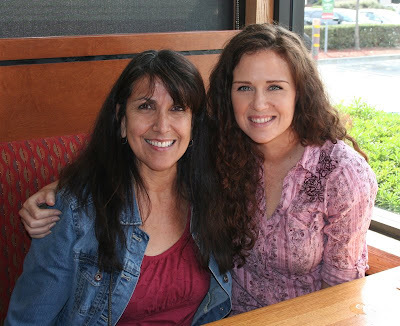 Liz is the first blogging buddy that I have met in person:) It was so fun that I think we should organize a California blogging-buddy get-together right here on the central coast! California is such a big (long) state, so it makes sense to meet in the middle. What do ya think? Now back to the cookies...When Liz gifted me with these cookies, I was speechless(well, not really)! What a special, personalized gift! I know much thought, time, and talent were put into the making of these beautiful cookies. Such a sweet gift:) I can't thank you enough, Liz! Liz made 8 hearts to represent my eight munchkins...each is beautiful and unique:). Don't you just love the cookie sheet! I especially love the mixer and refrigerator! Look at the amazing detail! This cookie is 4.5-inches by 3.5-inches. Liz paints the cookies with food coloring and brushes. Arty McGoo, I thank you! Stay tuned for a fun giveaway on Tuesday! Oh my goodness! 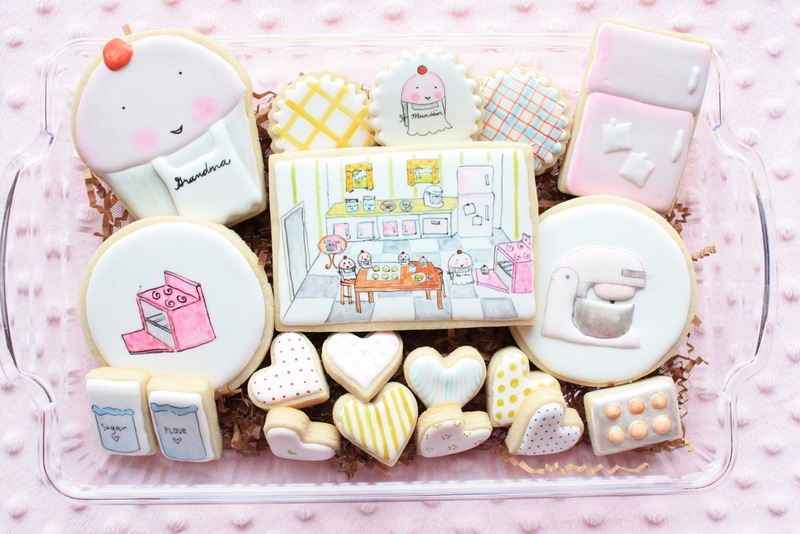 These cookies are so beautiful and adorable. Liz is truly talented and so artistic! I checked out her blog and it's just as lovely and amazing. Those cookies are enchanting. What a lovely gift! omg these are phenomenal. What an awesome gift! Amazing!! I love the meaning behind all this! HOW FUN!!!! YOU have a treasure! And now I am a little tiny bit jealous I don't live in California! A lot of my favorite cookiers/bloggers live there! Oh my! WHAT do you do with those cookies? You cannot possibly EAT them! I think I'd buy a shadow box and display them. I "think" you can use a shellac to keep them forever. Just beautiful! wow, so cool! and she did such a great job! isn't this blogging thing a riot??! I would hate to eat these cookies. They are amazing. Those are wonderful, Sue! What a thoughtful gift. I agree with the other comments...it would be hard to eat such works of art! Oh my gosh! What amazing cookies. I wish I could do a tenth of that!!! What a beautiful set of cookies and how lovely you have had the chance to meet up with a fellow baking blogger. I've seen Liz's cookies around and admired them for a while as well. You both look great in the photo. I just finished reading Liz's blog and delighted to be hearing reading yours. I'm so happy that you two only live an hour from each other and that you had the opportunity to meet in person. Your cookie gift to her was adorable too and I love what she gifted you with. I've met two bloggers IRL and it really is lovely to be able to spend time *chatting* together face to face. They say that strangers are just friends you haven't met yet...I know that the same applies to bloggers. Sue how fun! What amazing cookies Liz makes. These are just little pieces of art. I think I would save them forever! She is amazing and what fun. I agree, I want to do a blogging get together for Utah bloggers! It would be so fun to meet people. I love your talent...as you know!! You are beautiful!! Ciao Sue che meraviglia, grazie per avermi fatto conoscere Liz ;) davvero bravissima! I love that you have a cookie buddy nearby! how fun is that?!?! I really am speechless. Wow all I can say is wow! !